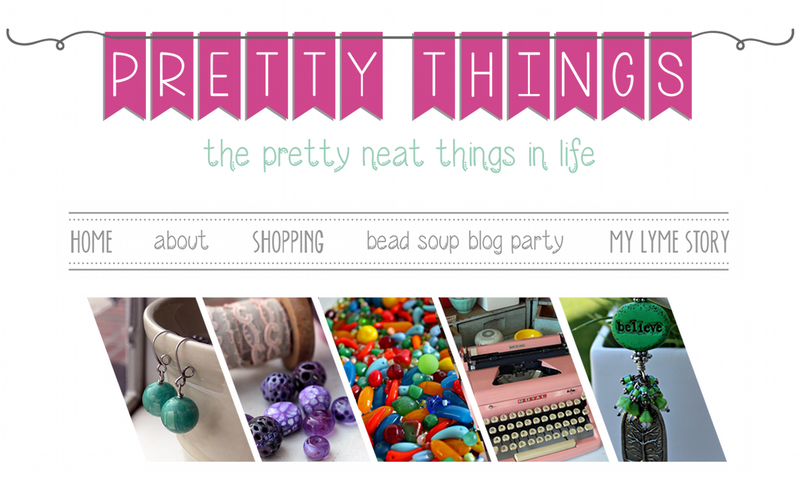 Pretty Things: Welcome to the 8th Bead Soup Blog Party! Want to join in the Scavenger Hunts and win things? Today is finally the day, and I'm so glad you're here! Thank you for allowing the date extension! 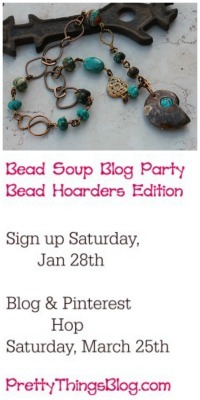 First, what is a Bead Soup Blog Party®? You can get the whole scoop by clicking here, but basically, I held sign ups one day for the event and paired people together from all over the world. Each pair was tasked with sending each other a Bead Soup, consisting of a focal, a special clasp, and some coordinating beads. The rules are you MUST use the focal and clasp (but not necessarily in the same piece) and that you use all, any, or none of the coordinating beads sent to you. You can make one piece or many. And there's a BOOK! Still can't believe it. The purpose: to get designers exposed to beads they may never have picked themselves (Bead Soups are secret until they arrive on the doorstep) and push people to design or think in a way they may never have. 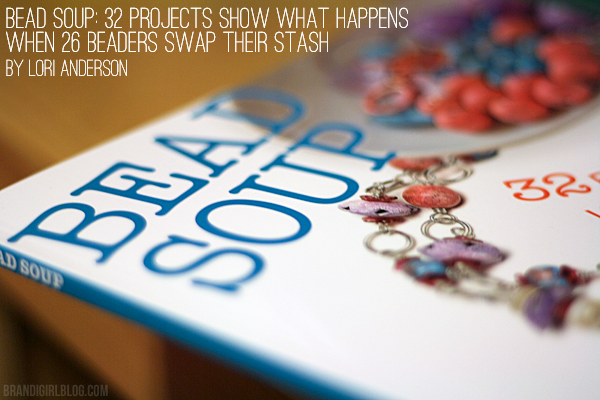 Digging into your own stash to add to your soup also helps you think of your own beads in a new dimension. Where are the nearly 500 participants from? I'm always overwhelmed by the response, and I appreciate everyone's making time to participate. I had two partners this year (click here to see the soups we sent each other). First is Claire Lockwood of Something To Do With Your Hands. I was tasked to create with a largely green palette. I have a hard time working with green and I have no idea why. I have green eyes, I like green beads. I actually have a lot of them. I just can't seem to think of what to put WITH them. I've never done that before! But I was determined to get that texture into the metal and by golly I did. I thought of the leaf as a pea pod for some reason, and wired some pearls onto the enameled piece and through the silver circle. I used some dyed orange aqua terra jasper, a silver flower, and pearls from my stash, the large citrine nuggets, the ceramic leaf charm, and a couple of rough amethyst top-drilled beads from Claire's soup, and made the toggle clasp she sent me front and center with the focal. I wanted to make a matching bracelet and pair of earrings to go with it, so with more of my orange beads (and by the way, orange is another color I rarely use! ), I used the coffee jasper and smaller citrine beads Claire sent to make a delicate charm bracelet and simple earrings. The purple beads are dyed crazy lace agate from a stash I'd forgotten about. This will also go well with a piece I made from my soup from Alenka Obid! Next, I wanted to tackle that rustic ceramic bead cap and the leather. I immediately knew when I saw it that I wanted to create a tassel, but I discovered that even though there was plenty of room inside the bead cap, I still had to do some finessing and experimenting to get things to come together. I didn't want the connections to show when worn, but I'm going to show you how I wrapped the leather tightly in wire, threaded it through the top of the ceramic (capped with sterling from my stash), and then adorned with silver chain from which the Czech glass leaf beads Claire sent me added the perfect final touch. See how that works? Tip -- trim the leather AFTER you've added your leaf dangles if you want everything the same length. It's sometimes hard to gauge how much of the leather you'll need to wrap at the top, and you don't want to get caught short. Finally, I wanted to use the large green painted wood bead she sent to me, as she said, "as a curve ball". I. Was. Stumped. And then I looked at all the purple beads I'd pulled out and thought, oh, here we go! Necklaces like these are fun to make and I'll tell you a secret. When I have days where my brain is just dead tired but I want to work, I grab a bowl of random beads and make wrapped loop connectors. That way, sometimes all I have to do is sift through the bowl to find the beginnings of a new design and just connect with jump rings. Think of it as sourdough bread starter -- once you have some going, you keep adding to it and taking from it as needed. I used the green wood focal she sent, and from my stash, slabs of dyed crazy lace agate, some lampwork beads with an shiny, oil-slick finish, orange aqua terra jasper, a funky pewter love knot, and some links from a deconstructed chain. You can wear this any way you like, with the green bead to the side, as I envisioned, or any way you want. Now to my second partner, Alenka Obid of Pepita Handmade! She sent me a very colorful soup made with her own polymer clay beads. The colors of yellow, green, and orange are rarely colors I pick up. I have no idea why I keep getting stuck in the blue/purple/pink, blue/purple/pink rut, so I am always glad when cool beads find their way to me and I can get my creativity cranking. The first thing I worked with was the large (about 2") yellow focal and the clasp. I thought of Carmen Miranda and Carnivale and mixed a big bowl of bead soup from my stash and hers. I used the green Polaris beads and orange seed beads she sent me and then started grabbing and snagging and mixing up a lot of crazy colorful fun colors together. Just looking at that makes me happy. I used a technique I learned by taking two classes with great friend and awesome bead maker Stephanie Sersich. Instead of working the way she usually does, with the clasp to the back, I wanted to make the clasp show. That meant figuring out a way to attach cording to both sides of the focal and work equally but oppositely. Remember my smashed fingers from working with Claire's soup? Well, I made another big boo-boo with Alenka's focal. Her work is EXTREMELY well made. I, however, know nothing about the dynamics of polymer clay after it's been baked. I needed to make the holes in the focal a little larger to accommodate the amount of cording I wanted to use, so I gently (well, I thought I was gentle), worked a sewing needle into the hole. After running in circles, flapping my hands, uttering oh no oh no oh no a few hundred times, I pulled my act together. I can fix this. But how? I didn't want to glue the piece back on, because I knew the weight of the necklace could compromise the join. It was actually a happy accident in the end, because the original idea I had for connecting the two holes with cording would have been too minimal -- I needed a more robust and more appropriate-for-the-size connection, which is what I ended up with. As I wrapped the cording, I did dot some jeweler's cement onto the fiber, but not to the focal. The glue was used in the middle of the wrap to help me keep things even with no slipping. I think it looks pretty cool this way, and if I hadn't told you I'd broken the top, I doubt anyone would have blinked, because the piece is abstract. Next I worked with the orange and red heart and tube beads Alenka made. I had a bunch of silk cording from Marsha Neal so I started pulling every shade of brown, orange and yellow in the lot and started laying them out. 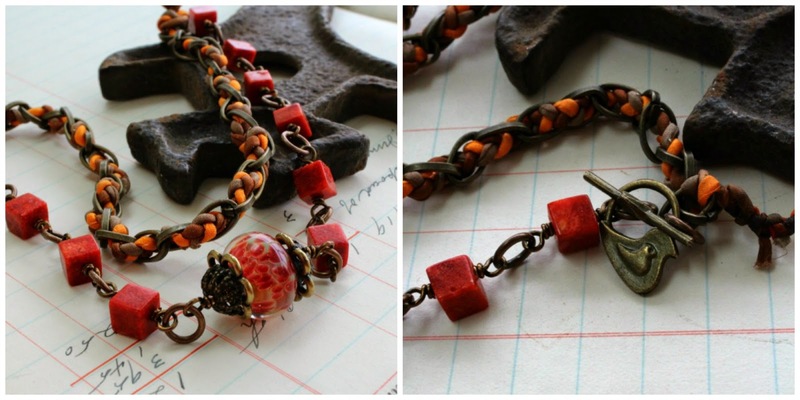 I ended up choosing three shades and making a long braid, wove the braid through chain, and then used the coral cubes Alenka sent and a lampwork bead from my stash. I'm pretty pleased with this, as I've never really worked a lot with silk cord, although I love how it looks. I had an orphan lampwork bead on my desk, and added a cute bird clasp I had on hand. I made a matching pair of earrings with the polymer clay tube beads and coral cubes. I have plans for the yellow and green connectors and blown glass beads she sent, but I'll save that for a little later in the week, I'm thinking. And there you go! Most of that, believe it or not, was made in a week. The most time-intensive was the Carmen Miranda piece -- I had to parcel that over many days. I enjoyed being back at the bench, though ... it's been far too long! Please start anywhere on the list -- bottom, middle, first from each section -- mix it up! I hope you'll take some time over the week to visit people, and I'm going to add a great giveaway later next week to give you even more incentive to visit these wonderful people. With it being Mother's Day weekend, many people will be a little late in posting, so come back around in a few days to them and give them some love. Looking for a certain person? Use Ctrl-F and type their name into the search box. If you have a Mac -- I'm shrugging my shoulders because I can barely turn those things on. Oh, I love the pea pod idea ! So cute ! And so many oopsie - poor darling. You did good and awesome, my dear <3 Favorites have got to be the pea pod and the red heart ones. ...Yeah, guess who was too excited and woke at 4am like a kid? 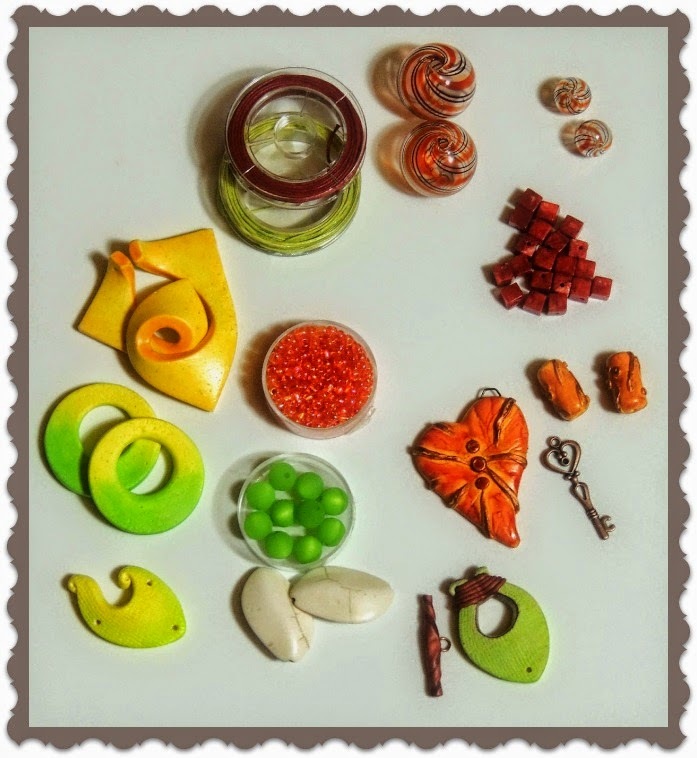 Seriously, though, you've made so many lovely pieces there - I especially love the one with the yellow polymer clay focal. I know I'd have been terrified by those citrus colours but I think you absolutely nailed it! Thanks so much for organizing the party this year; I've had an amazing time. oh wow! which one do I like!!!! 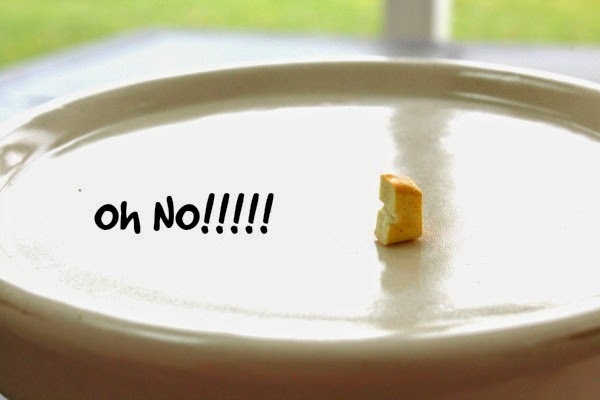 probably that one with all the colorful chips on it. boy you have been one busy gal. hope you are feeling a whole lot better! I thought of Carmen Miranda first thing as well, when you first introduced Alenka's colourful bead soup! Very cool creations! Lori you are awesome. You still managed to make lots of jewelry. Woow!! I love the pea pod idea. And I can see so many other ideas in your creations I will have to try. Yes, the only way to make a hole larger in polymer clay is to use a slightly larger drill bit and twist. Ah, live and learn, live and learn. Lori Your jewelry is very pretty ...I love it all...my favorites are the pea pod...and the yellow focal necklace....all are pretty. Good job!!! Thank you for let me be in the party. Love how this event challenges artists/designers to step away from their comfort zone. I have no idea how you manage to make such beautiful pieces from TWO bead soups. I have enough trouble coming up with ideas with just one soup. Your talent is amazing. I love the green and purple necklace - that's definitely my favourite although the red/orange heart necklace is a close second. And that Carmen Miranda necklace? Genius! Thanks for coming through again with a fabulous BSBP. Awesome designs! I am in love with the Red/orange heart necklace. So a design that I would wear. You have a fantastic eye even when you're flat on your back and in pain! I love what you did with the broken focal, it looks amazing! Thanx for all you did to make this party possible. I thought the fold formed leaf looked like a pea pod too and I like the clasp front and center. I really liked the bracelet design with the purple dangles hanging from the squares. Your tassel is a very unique and creative design. The great color in the Carmen Miranda design is way cool. The part about running in circles and flapping my hands in a panic made me laugh. I could see myself doing that too. Kudos to you for figuring out a way to fix the problem. I am not much for orange but I like what you did with Alenka's orange heart . I could even see myself wearing that necklace. It is wonderful to see you back at making jewelry again. Your designs are always so inspiring. OH WOW Lori! Love all the colorful soups you got! Your jewelry is amazing, how everything is put together! I had fun with my 1st foray into the Bead Soup world! Thankyou! Hopefully next year my making skills will be better! Lori, once again you did it! Amazing everything my friend! Congratulations for all your creations and for this event that will keep opening doors and make us be so grateful for ever having met you! Love, Laura Blanck from Openstudio/Openstudiobeads. I love all of your pieces, as I usually do. But I adore the colorful necklace with the fruit beads and colorful Czech glass and bright yellow pendant. It is so cheerful and vibrant that I imagine anyone wearing it would be beaming all day long! It's peppy. Thanks for putting this all together Lori. Happy blog hopping. Beautiful designs, as always. I love the "Carmen Miranda" necklace. Wow!!! Such fun and funky pieces. I love them all. My favorite is how you decided to use the leaf. The silver medal and the pea pod are perfect. I think I'll learn tons just from looking at everyone's soups and seeing how differently everyone thinks. Thank you for doing this! First, THANK YOU SO MUCH!!!! I am so excited to have been a part of this group. You are such an inspiration and I have found that I love blogging. Your pieces are gorgeous. The booboos brought amazing work to fruition! Thanks again! You may want to consider using the gorgeous bright colors from now on...you did an amazing job of showcasing all the primary colors! Each of your pieces is vibrant and lovely. Wow Lori all your creations are just gorgeous!!! Love, love, love! I like how varied the components of the peas in the pod necklace are. I'm a big fan of Alenka's work so I love all those pieces. Thanks for doing this for us every year. Sorry this was my last year to help add Japan to your list, but excited to have speedier shipping next year when I'm back in the States. Phew I don't feel nearly so bad about taking a hammer to one of my partner's beads! But what a happy accident I love how cool that yellow focal looks wrapped up in leather and the earrings are a joy too. Loving the orange heart too. The pea necklace is soft and the fresh colours are perfect for summer and the tassel is fantastic. Best wishes for your stepson's wedding too. The peas in a pod from Claire's soup are adorable! Lori, you are so creative. 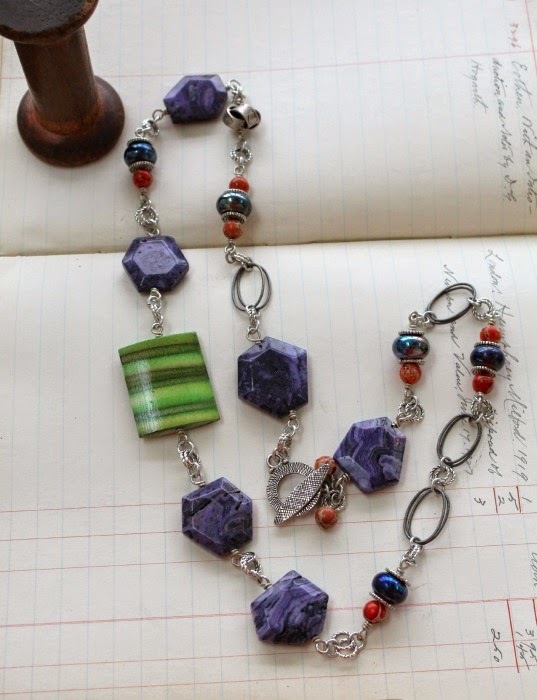 Beautiful necklace -- and I love the idea of creating wire wrapped components to grab later for design inspiration. Alenka's soup also transformed into brilliant jewelry. The braided leather and coral cubes look cool, and I would never had imagined the focal was broken -- oops, but all is good! You always amaze me with your talents and the beautiful jewelry you create. That is definitely a peapod! It needed to be a peapod! Love love love the Carmen Miranda piece, it looks so happy! Fabulous party Lori, and you've made some fabulous bling to wear to it! I love your creativity! I think my favourites are the pea pod necklace and Carmen Miranda, oh the work that went into that one!!! So many beautiful designs! Thank you so much for being our hostess especially with everything you've been dealing with...I hope the road is getting smoother and in the meantime sending you much love and light for healing. Good morning dear HOSTESS !! Beautiful Lori! I love all of the designs you made and for being as sick as you were I'm surprised you got so many made. Your fabulous!Thanks so much for all you did to make this a great party! Wow Lori all of these designs look beautiful! I especially like how you fixed the yellow focal piece that broke :) it looks like a party! I really love the green wood piece it's lovely. Thanks for working your self silly with this party! We all enjoy it. Your the best :)Happy Mothers Day to you! first I want to say Thank you for all the organisation, work and heart blood you put into this 2014 BSBP. You did awesome pieces with your soups. The necklace with orange heart is my favourite. Usually I don't like this colour but here it looks stunning. I love fold formed pieces. It's great for getting your frustrations out. Very cathartic. The colours in the second necklace are awesome! Fabulous, fun, and bright pieces. I love and would wear any of them. I can't believe I'm awake and on the computer at this hour but I was too excited to sleep. BTW, the name search for Mac people is command-F. Thanks for having me at your wonderful party! wow Lori I love what you made with your soup. the yellow focal with all the color is so so yummy. Beautiful designs Lori, I love your idea of making the connectors ready for designing! Thank you for being a great hostess, I've had lots of fun! I love how the matching bracelet and earrings coordinate with the necklace but don't necessarily incorporate exactly the same components. Thanks again for all the hard work, dedication and positive inspiration! I love the pieces you made, especially the colorful necklace. And you are right, you can't tell the focal was broken. 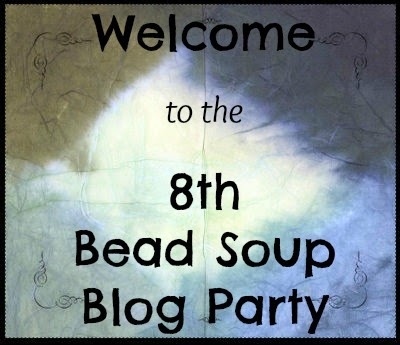 I also want to say a huge thank you for organizing yet another Bead Soup Blog Party, I cannot begin to imagine the amount of work that it requires. And then to think you are battling with your health as well. 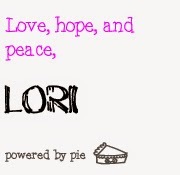 Lori, I hope and pray your battles will soon have results and that you are healthy again!! Thank you for making a great party again, Lori! Your jewelry is happy and colorful, my favorite is the bold yellow necklace, and especially the story behind it. You are a true creator of gorgeous jewellery, making it up as you go along when things are tough! The peapod is so inventive. My favourite! Oooo you received lovely soup. PS. 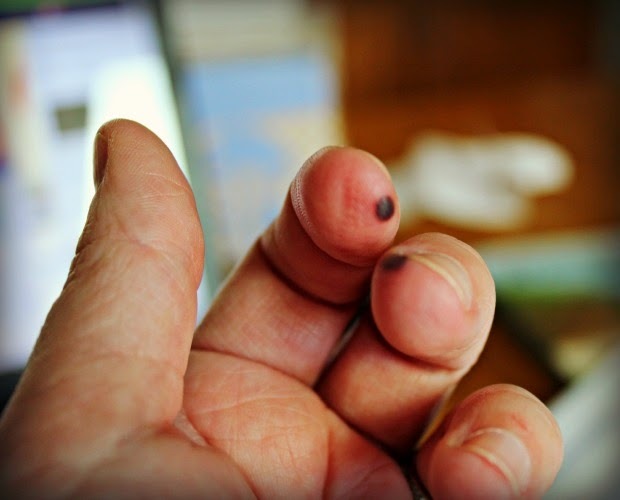 Your poor fingers - youch! Oh, Lori, gorgeous work as always!! From Claire's bead soup my favorite pieces are the first and the last necklace, it would be really hard to chose one of them. Love how you combined colors and textures. Well, I should have worned you to be careful with the hole of that focal, because the piece is not very thick (or I should rethink the design to make it more strong), but never mind - you've found a perfect solution for the break!!! I fell in love with the second necklace with the heart pendant!!! I really love every little detail of it, it's just perfect for the pendant. If I would have to chose the ideal necklace for the pendant - this would be it!!! Thank you again for being my partner and giving us the opportunity to enjoy such a great party once more time! I love the Carmen Miranda piece - it made me think fiesta. And the pod made me think of Lily of the Valley. I use a drill bit (by hand) to increase holes in polymer clay beads, but you need to keep taking the bit out and removing the clay in the thread otherwise it can crack the bead. Thank you so much for organising another party. Hey Lori first I would like to ty for all the help u gave me. Now for your soup creations. I love your color combinations especially the green/purple/and red combination. Your designs are amazing ..You are one brilliant amazing and very strong person. All so lovely, so creative as always. Love the colorful, happy necklace and heart necklace/earrings set. Thanks for bringing this wonderful event together! Like how you turned the leaf into a pea pod. Very cute. And I LOVE how your Carmen Miranda piece turned out. Just Awesomesauce! Also love the polymer heart piece too. But then orange and green are my favorite colors. Still frantically trying to get my own post finished. Stopped by for the links. Now back to work. Oh my goodness! What wonderful creative pieces you made -- you are such an inspiration :) Love how you 'fixed' your booboo. Like you said, we never would have known! And again Mahalo Nui Loa (thank you SO much) for bringing us all together! I love all the pieces you made! Thank you for the wonderful blog hop. I don't know how you coordinated so much from your bed. You are amazing! 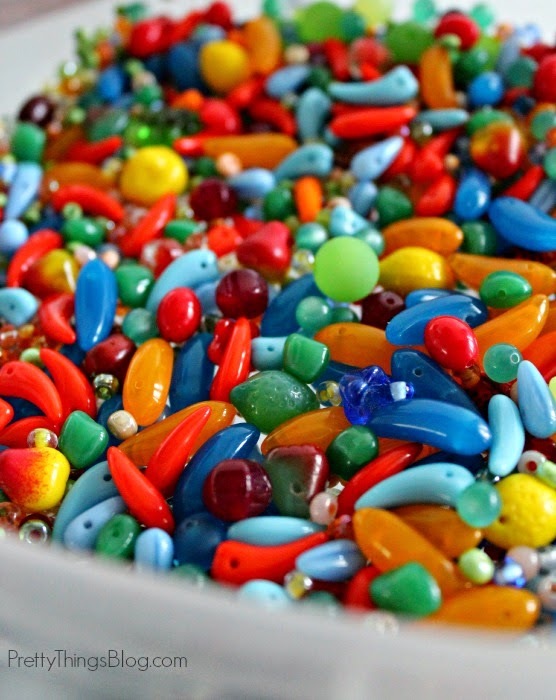 Thank you for coordinating another bead soup! I love the pieces you made. I don't know how you accomplished so much from your bed! Lori, thank you so much for this great occasion to find so much eye candy and inspiration from all over the world! Your designs are always clever, colourful and gorgeous! All of your pieces are unique and wonderful. I would have found all of the colors in the second soup totally overwhelming but you pulled it off beautifully. I love the idea of a pea pod in the first piece. Thank you for all of your time and effort you put into making this blog hop possible. It is a monumental work of love. wow Lori , I am amazed at the finished pieces you made especially while lying in bed . good grief, i don't do that well and I'm sitting at my beading station. Love the carmen miranda one. it makes me want to dance. Hope your ouches heal soon. I'm off to visit some other blogs now. BTW on Macs it's the same to find someone, hit the apple key (control ) and f and a tiny search window pops up at the top of your blog . Beautiful pieces Lori!! I was partners with Alenka one year and had a ball with her fantastic clay. Now...what to do about Colorado and North Dakota!!???? :) Thanks for hosting this great party once again!!! It's one of my beading and blogging highlights of the year! Love what you did with it all. They are wonderful. Thank you Lori for letting me participate. I have enjoyed it. Oh and on a Mac - the find feature is command f.
Awesome job Lori! I love the way you turned that green leaf into a pea pod. The whole necklace is great. The tassel piece is really clever. I love the mix of leather and chain. And...Carmen Miranda!! That necklace seems like a symbol of all of the fun and good health and happiness that is coming back to YOU my dear! First thank you so much for sticking with us as you were facing so many challenges. Your pieces are all so beautiful and creative. I appreciate that you shared your thoughtsand techniques. Wow! Just wow! These are all awesome! I really love what you've done with the bead cap and leather in particular. I've got the matching cap still (they came in pairs), and did hope to use it in my soup - just cos... But I struggled with making a tassel I liked - you've done a fabulous job! Do you know what else I really, really? Those dinky wee earrings. Simple but so cute! You've inspired me to make a similar pair for myself! And I love what you've done with Alenka's soup, especially the fruity necklace. Thank you for hosting again! It's always so much fun. And I love what you did with all your soups - please don't ask me to pick a favorite. I've said it before, I'll say it again - you rock. Your pieces are so amazing! The color and styles of them all so different. You really let the beads speak to you :) My favorite is the oopsie piece! GORGEOUS!!!!!!! Thanks so much for all the work you do for the bead soup blog parties. I know it's not an easy task! I love that you turned the leaf into a pea pod. It looks so cute and I love the pop of color with that necklace. The Carmen Miranda necklace is awesome. All the color with it just leaves you feeling happy indeed. I, too, have done the bang, bang, ouch thing. :) A class I once took helped with that. She took apart a clothespin and used one half of it (without the coil in the center) to hold down the metal while she banged with the hammer. It really helps> Love your soup and your creations. Glad you were feeling well enough to get some creating done. Thanks for the opportunity to play again this year. Oh my what beautiful creations! Thanks for everything you've done for the Swap. Gotta go .... So much to see! I am constantly amazed [by now I shouldn't be] but you make the most wonderful Works of Art!!! I like all of them and your post reads like a good book, I actually cringed at your fingers, went OOOOOOHHHHH at you jewelry and went OH NO!!! at the broken piece, then I sat back and laughed at the finished piece!!! Leave it to you to make it perfect!!! LOVE LOVE LOVE it all!!! Have a Blessed Day!!! Woohoo - great soup, Lori! The tassle necklace - great! But the true stunner is the Sersich necklace - wow, I felt in love with that piece! Thank you once again for all your efforts you put into that especially day! The pea pod is absolutely sweet, I also love the green-purple combination, perfect together. And the last (but not least) 2 necklaces are so warm and springy! 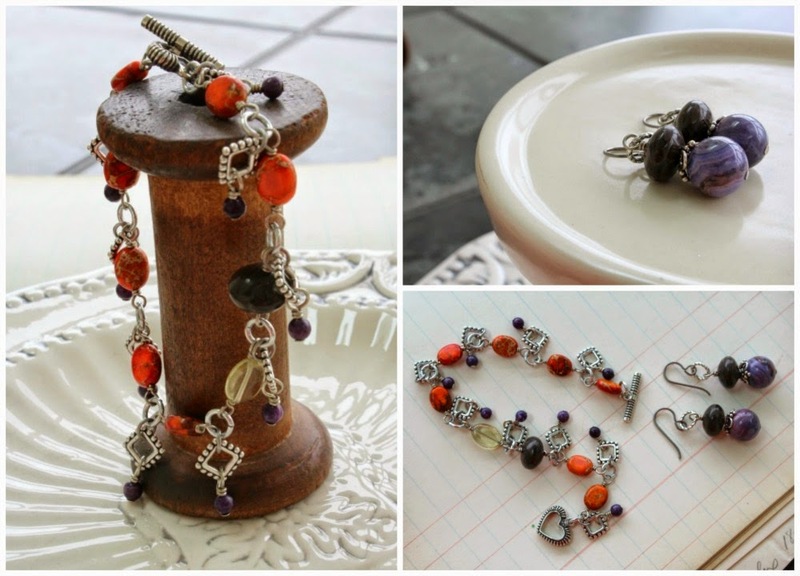 Beautiful pieces as always, Lori. I'm in awe of you and how you always manage to pull it off, whether we're talking about a jewelry piece or a huge blog hop. Thank you for all you do. I enjoyed reading your post and how you problem solved the creation of each piece. All the pieces you created are fabulous. I am partial to the one with the heart though I don't like to use hearts in my works and I really like the simplicity of the green bead cap. And Carmen Miranda is so much fun and a lot of work went into it is obvious. Love the pea pod necklace, the tassel and the heart necklaces. That last piece is a party in itself. Those color palettes really compliment your creativity. And, thanks for hosting. Thank you for pulling this blog hop together this year! I'm so excited to participate for the first time. I have a hard time with red orange and yellow and also love purples....the orange heart bracelet is my favorite but I can't say why. The subltle mix of colors and wonderful texture just make me feel warm! I loved all your color combinations as I have a hard time using lots of bright colors together. The greens and purples really worked well! Thanks again and keep healing! You created such amazing, happy and colorful jewelry! Thank you for giving all of us the opportunity to have such a great time despite all your struggles. I wish you all the best. I always manage to catch my fingers with the hammer too ;-) Your bead soup creations are all wonderful and you did a fantastic job with the broken focal! I love how your added the reddish orange beads to your ingredients. Very nice touch of color. I'm really digging the tassel necklace! I love your pieces, especially the pea pod but I really love how you recovered from the broken clay focal, the wrap really gives it a unique appeal. 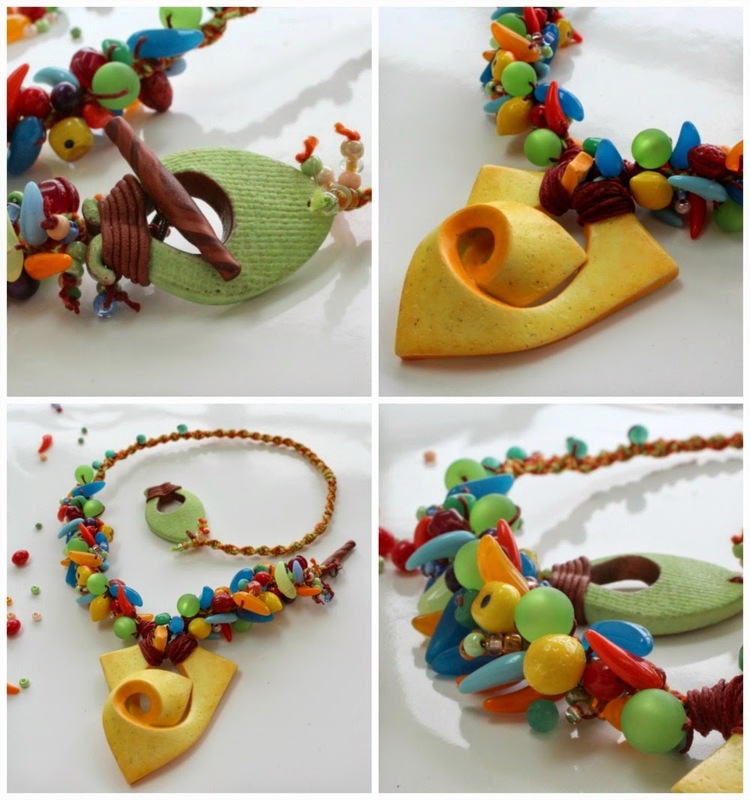 Wonderful pieces, the fruity necklace with the yellow focal is fabulous! A summery statement piece! Gorgeous creations, Lori!! Thank you so much for all that you do! You are the BEST! WOW! How amazing pieces you made from the two beautiful soups. You always have so creative ideas. Thank you dear Lori for this great Party! WOW! I love all your designs, Lori. They really make me happy. Great summer jewelry. I'm having sooo much fun at the party. I'm learning an incredible amount again this year. Thanks for your hard work. Thank you so much for allowing me to participate this year! I really enjoyed my partner, the bead soup she sent and the results of creating new pieces! I completely understand what you mean about a certain color, I feel the same way about yellow and white! But as always, your pieces are extraordinary! You included a difficult color in a style true to your timelessly beautiful technique of mixing different shapes, textures and colors and the end results are wonderful! I love how you demonstrated fixing a break during creating. You, my dear, are unstoppable! Lori, what can be said. First of all, your jewelry is gorgeous, as always. I love the Carmen Miranda piece and the piece with the hand made tube beads is gorgeous too. But it is all clearly the work of a pro. Second of all, this whole annual party has been such a wonderful experience for me the last four years. I have thoroughly enjoyed it. You do so much for so many and while your health has been giving you such fits too. You are an inspiration for us all. I know I could not do what you do. While I understand that this may be the last one, I hope, hope, hope it won't be. You take care of yourself, enjoy your party, but for now, I must mingle. Thank you so very much, Lori, for all of the hard work and time you put into making this Bead Soup fun and inviting for the participants. You did a magnificent job, especially considering the many obstacles in your way. Thank you thank you! It was a blast! And will continue to be fun and inspirational as we all visit the many blog reveals. What you did with your soups is beautiful! That necklace with the explosion of color-wow! WOW< WOW < WOW!! With all that you ahve had to endure with your health, organizing this Reveal and dealing with unending computer frustrations and again health issues, you have doen it again!! amazing!! I bow down to you !! You are a mentor and model and goddess to me and I hope to all of us!! Don't you dare pooh pooh this , as it is TRUE!! And you have conquered your fear of green and you overcame your little boo boo with the polymer and your fingers have the blisters to show for it!! Yes you need to treat yourself to a rolling mill!!! With the polymer, next time drill it out and you will be golden!! Love all the pieces that you created!! have a glorious Mothers Day!! Big hugs!! Love! The pea pod is fantastic and I love how you solved your little mishap!! You've made so many gorgeous pieces, so glad I don't have to pick a favorite. I'm really glad you had the energy to work again, hope you will continue to feel better. Thanks so much for hosting this awesome hop, you are the best. Wow! All of your pieces are beautiful! Such a lot of thought and creativity into each piece. While I like them all my favourites are the polymer pieces...the riot of colour just made me happy looking at it! Thank you for everything you did! 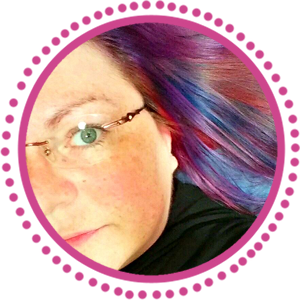 I'm so happy to have been a part of the Blog Soup Bead Party. Love all your pieces. Thanks for organizing this year and all the years past. I'm off to hop. Awesome designs! Hope you had fun making them even as you weren't feeling well. Lori I love how you worked the silver disk (not the fingers bit) as background for the leaf it really works well as a pod, nice! That neat leather tassel is great I don't work with leather much but I like this idea. The green wood bead looks really nice with the purple nice colour combination there with the pop of orange. Love how you worked out a compromise with the yellow Polymer focal it makes a really fun piece. I liked your use of silk cord on the yellow and orange heart that is different, I think you have certainly risen to the challenge and produced some really great pieces! Lori they are all awesome. Each one of them is so completely different in style but all gorgeous. 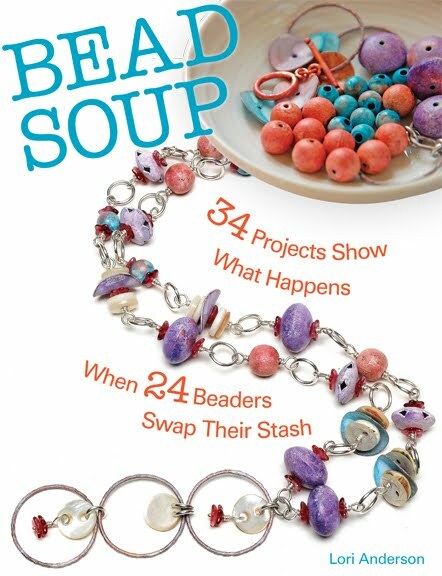 I love what you did with the bead cap in the first soup and the "Carnivale" piece from the second soup. I would totally wear all of them. Thank you again for being such an amazing hostess! <3 And, as always, your designs are magical--they are so fun and happy this year! Wonderful work! I am partial to your pea pod necklace. The best thing about polymer clay and real lucite, you can drill it. You "need" a rolling mill like I "need" a flex shaft, lol. So original! I would never have thought of using the color combinations that you did and that would be my loss. I need to learn to think out of the box. Well done you! Fantastic Lori! 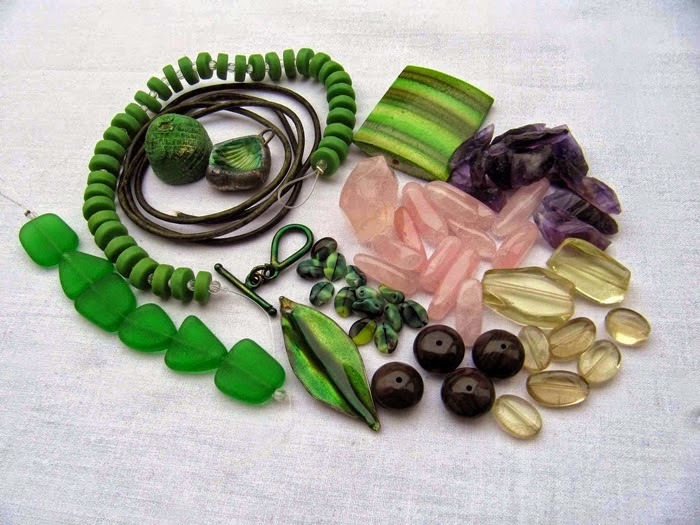 I especially love the necklace you made with the green wooden piece and purple beads - that's just gorgeous. Thank you SO MUCH for hosting this - it was wonderful. I love, love, love what you did with the broken focal!!! I laughed and laughed at the Oh no, oh no, oh no! What an inspiration you are, Lori, Thank you once again for bringing this all together! We are all indebted to you and hope you will want to do this again. I have met some of the nicest people and seen some of the most amazing work!! Beautiful designs Lori! I love the Carmen Miranda! Thank you again for all your hard work! Beautiful as your creations always are . Lori. 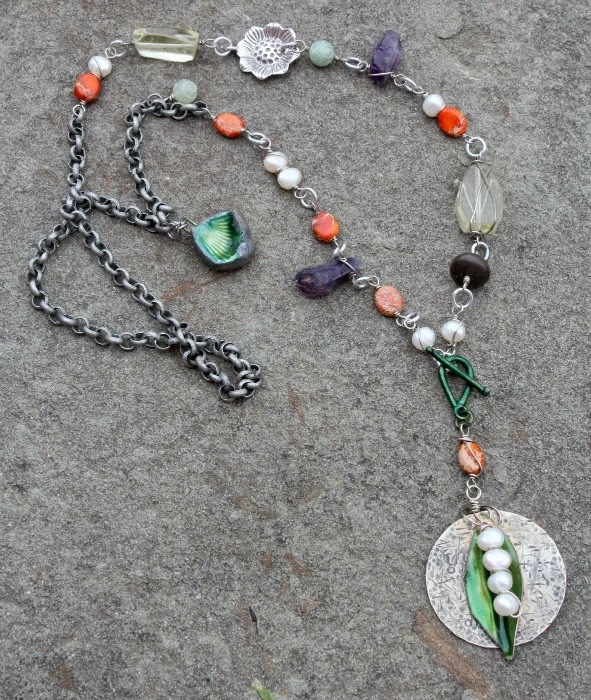 I loved that green leaf focal and clasp as soon as I saw it and what you did with them as a peapod is awesome. You really got a workout with the two bead soups .I love that you went from an very earthy soup and created some beautiful pieces using the chain and also doing some wire wrapping .The second soup gave you the chance to work with the bright candy colors beads .When I saw them I wanted to eat them. Beautiful work. So many cute pieces Lori. You are so talented and always an inspiration. Thanks for hosting the party. We love you. I was so curious about the yellow bead :) I like what you did with it very much. Everything shows that a true artist will not compromise with his work even in a bad situation. You are a truly inspirational example to all of us. Once again you rocked out your soup(s). Despite all that is going on in your life. Fantastic!!! Not even a broken focal can trip you up. Thank You once again for doing this! I would never have known you broke the focal if you didn't share, the way you wrapped it really fits the piece. Everything you made is wonderful and you did a great job working in green! Thanks for once again pulling off a wonderful Bead Soup party! All of your work is amazing but I absolutely love the orange heart piece! Lori, I just KNEW your things would be lovely! I especially love the peapod and the Carmen Miranda necklace. Thank you so much for hosting the swap, and thanks to Rick and Zack for their help! Lori!! You fixed that BOOBOO really well. I love how those beads came together. Such artful pieces! But then your work is ALWAYS artful!! I love the pea pod, it is so effective! And that tassel is way cool. As a fellow Steph Sersich fan/friend and follower, I of course adore your take on the knotted necklace. Thanks for this year's BSBP, looking forward to next! You have absolutely outdone yourself. The pea pod is brilliant, I love love love that necklace and the bracelet and the earrings. Awesome pieces from Soup 1. I am partial to bright and colorful so the Carmen necklace really touches a soft spot. You have captured the happy feeling so well. Thank you Lori for another great fun party. Hugs from Canada. Oh, my, Lori - where do I start? First by thanking you for everything you do. I can only imagine how hard it might be for you, and the fact that you still organize this humongous party shows how much you love it. Thank you! As for your pieces - they are completely, 100%, totally adorable! Gorgeous, incredible cheerful (that Carmen Miranda piece is just perfect! ), and absolutely fantastic! Love and many hugs, hope you're taking time for yourself this Mother's Day weekend! Lovely colours! It really is candy for the eyes. Nice recovery of the bead Alenka sent you. It turned out fantastic! By the way, thank you yet again for hosting this event. Like many people, i would like to see you continue with a full palette of colors! Great looking pieces. Thank you for including your problem solving process! First of all Lori, I just have to say THANK YOU so much for organizing everything during such a trying time for you. Second of all I have to gush about how gorgeous all your pieces are! But have to say the Carmen Miranda necklace is my favorite, I love all that's going on in it, such a fun piece! Many thanks again! Wow Lori! These are fabulous pieces. I love the necklace you made with Alenka's beads. The colors are awesome! The way you handled Petra's (looohuuuv her work) pod/cap-way cool!!!! Thanks again for a wonderful party! what an amazing collection of creations...amazing! Oh wowee! I' both a bif fan of greens and oranges AND a big fan of Alenka's components. Tip - if you need to make a hole bigger in polymer clay use a drill. A hand drill os perfect or a drill on slow speed so ir doesn't melt the plastic. Beautiful makes Lori. It is so amazing how the addition of one color can make such an impact. I think you're addition of orange in the first necklace was a great pop to the design and I love what you did with the focal! The addition of light blue in the Carmen Miranda piece just tied it all together and made it complete, I would never have known you had an oops. I just love Alenkas polymer heart and tube beads and you did a great job with them! Lots of wonderful work in just one week. Thanks so much Lori for all you have done and for sharing so much of yourself. I love each one! But my very favorite is the Peas in the Pod necklace—so very pretty! I think orange and silver is a lovely combo and I'm always impressed with the way you create with such elegance—even with bright colors and funky shapes, there's always a unique air of refinement about your work—beautifully done. Thank you for such an awesome party! Oh, Lori, there is no way to tell from these beautiful pieces that you've been running at anything less than full speed! The way the leaf/pearl pod echoes the shape of the clasp is wonderful -- the Carmen Miranda necklace is a fiesta of joy -- the whole group of work is a signal that your spirit is ready to fight through everything life throws at it! What a soup.....very colorful like you Lori. Loved all the pieces you made. I marvel! I love how you held your composure after your mini freak out moment with the one focal-I don't know how well I would have faired but you pulled through beautifully and you're right, if you didn't tell us I don't think any of us would know it was broken! Thank you for putting on another fantastic BSBP! I love all your pieces, one more fabulous than the next. 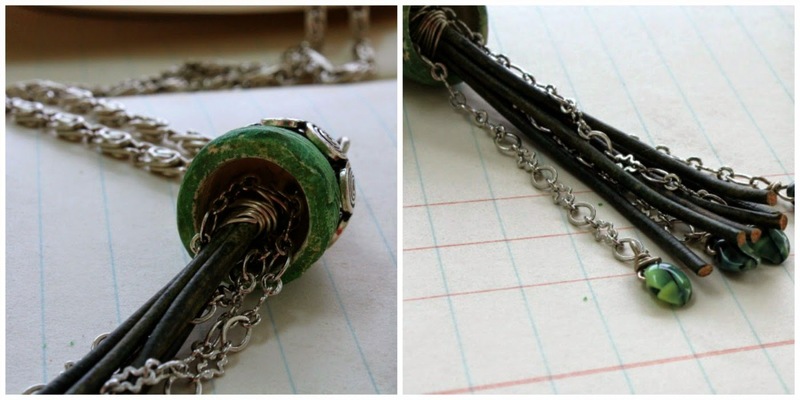 My favorite might be how you used the large green bead that "stumped" you (but not for long. You are right; I never would have known the focal on the Carmen Miranda necklace had been broken. I love that one too. Let's face it, I love them all! I'm having so much fun hopping around. Thank you for this hop! You are so creative! I really like everything you made and would wear any of it. The color combinations make my happy; they're so cheerful and bright! Thank you so, so much for all you've done for us during this project. You've got fortitude and determination that are truly amazing. We appreciate your hard work and that of your assistants as well, including hubby. I'm sure there's a lot more we don't know about, so thank you for the unspoken, as well. 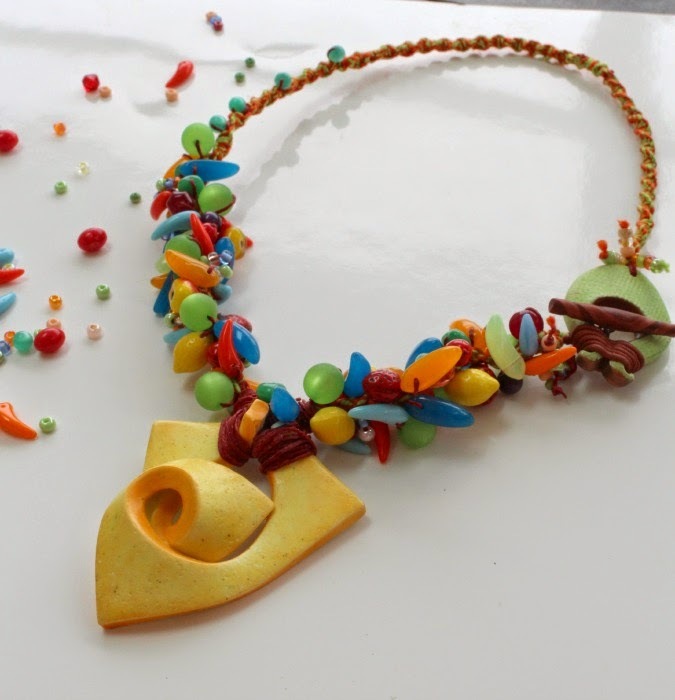 My favourite is the bold, colourful necklace you created with Alenka's focal pendant and clasp. Such a happy piece. The colours make me think of all things happy and fruity. I don't know how you do all the things you do Lori but thank you for yet another awesome bead soup party! You amaze me! Lovely pieces, as always despite being sick in bed! The Carmen Miranda piece is my absolute favorite -- construction, design and balance -- flat out gorgeous! Thank-you Lori for being such a fantastic and inspiring hostess. I hope the moments you spent designing these amazing pieces brought you as much joy as viewing them and participating in this hop bring the rest of us! Oh Lori... love all you made with those two soups.. They are gorgeous!!! I was inspired while reading and learned many new tricks, new possibilities, new ideas, and many new good things more. Thank you Lori for this BSBP.. lots of fun indeed. Thanks again for organizing this and good luck! You are a special person, Lori! Thanks for all the things You have done for this magic BSBP! It's my first one but I'm waiting for the second! Love your works! And the colored necklace is a flash of happiness!!! Lori, you have outdone yourself with the Carmen piece, am so glad everything came together.. it's so fun! I am also so very happy you are back to creating!! YAY! - Thank you again for all you do! This soup was especially good for me too! Lots of love to you! Happy Mothers Day! Fantastic pieces! Having them come together must have made up for some of the pain! I really love the thoughts of Carmen on your necklace. It really shows, even the focal makes me think of the wrapped hat she wore. 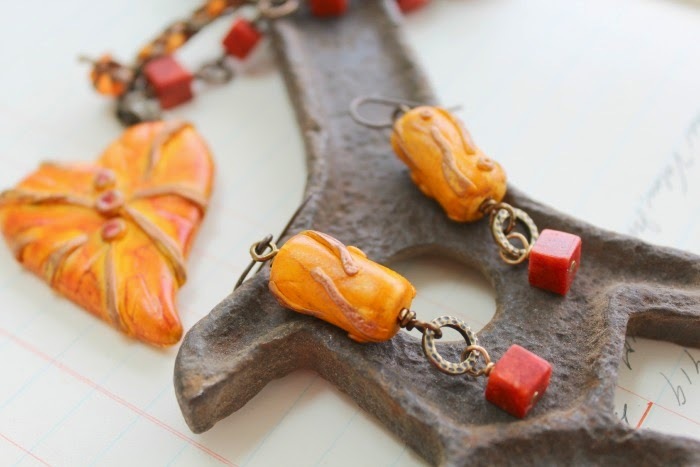 My other favotite is the orange cord necklace...I have been eye balling Marsha's gorgeous silks! Thank you again for all your hard work. Even with all your struggles, you managed your way through, and put on another fantastic hop! I love what You did with Alenkas Soup! You are a wonderful designer, but today this peace bring a smile to my heart! Great job, Lori! Love the pea pod necklace (though I'm sorry it cost you hurt fingers). Love the polymer, especially the use of color! Fun! Wow Lori, you have made so many pretty pieces. They are so bright and playful - perfect to spruce up any outfit. 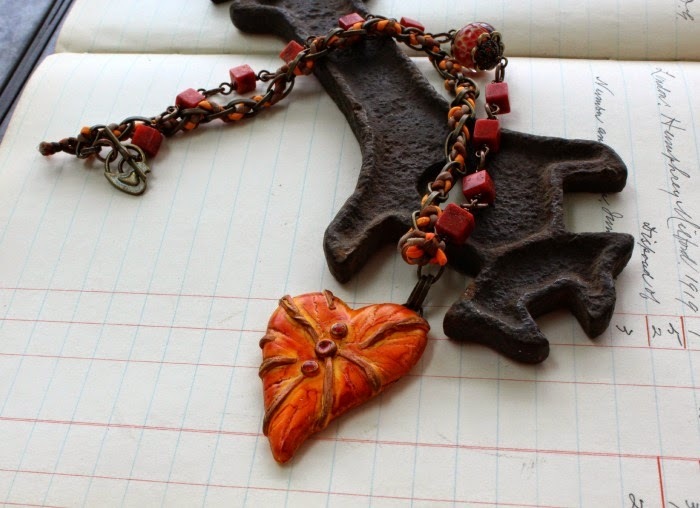 Just love the orange and red heart necklace - so so pretty. In addition to the incredible experience I get by being a part of BSBP, I get to be inspired by your designs! Win, win!! Love how you put the pieces together, and that's a great tip about the bead connectors. I could just feel your panic when the focal broke, but man, you so saved it with style! Love that cord in the design. You just rock Lori, plain and simple. Wow, Lori...These pieces are all so pretty! I adore the orange heart necklace and the Carmen Miranda necklace is loads of fun! Thank you very much for all of your hard work and dedication...We are all having fun at this party you are so graciously hosting! Lori, such beautiful and creative designs. All of them. I particularly love the two necklaces from Claire's soup. And the Carmen Miranda necklace is just fantastic. 2 Very different soups but Lori shows through in all the creations! I really love the fun Chiquita banana necklace even though it gave you a tough time -you pulled it off! All your pieces are lovely. I'm in awe of your creativity and talent! Thank you so much for organizing another amazing Bead Soup. First of all I want to thank you for all the work you put into this, what a job you did and this being ill as you are, I have nothing but the utmost respect for you! Next: what wonderful soups you received and what grandiose pieces you created, I would seriously have trouble picking my favorite piece, really, they all have their own personality and are different enough from one another to be attractive in their own way! Awesome job! Lori, you've done it again!!!! Many many thanks for hosting this HUGE wonderfully fun blog party!!! All the creations are so different, diverse, unique, and simply fabulous! I also love your creations as well! For being "sick", you've been a very busy lady :) and have some beautiful pieces. I think my fav is the yellow with all the color. It's so springy and will look good in the summer as well! Firstly a huge thank you for doing everything you have, you are utterly amazing and an inspiration to us all! Wow you came up with some fantastic pieces and all so very diffrent! I love what you did with your curve ball, those purple beads are stunning and contrast so well with the green, but for me your star of the show has to be the yellow focal piece, what a stunner the colours are amazing and its just such a happy piece! Hi Lori, Thank you once again for holding such a wonderful hop this year. Lovely pieces of jewelry. I am really drawn to the pea pod one, I love how you used the textured piece behind the pod, it really made it "pop". Brilliant! First off, I want to chime in and say thank you for organizing the Party. It was my first time and I enjoyed the challenge very much. I know the creativity that is sparked will carry through for a good while. Love what you did with both soups. My favorite detail is the wire wrapped citrine nuggets, or maybe the green leather tassel. Love them all really! Keep feeling better and better. Wow, I love what you did with the yellow focal, what a great shape to work with! Lori, Ive been back to your page 5 or 6 times and each time I pick a different favorite. It's time to commit...I choose...The Carmen Miranda look. :) Seriously, Your designs are beautiful and flow so easily that I stay in awe of you. I want to be you if I ever grow up. A-Mazing!! Love that first one w/the pearls (of course, right?!) and then, the one w/the colorful little fruit beads - Carmen Miranda - yep, that one ROCKS!! Awesome soups! I couldn't participate this go around, but am having fun hopping around and checking out all the delightful soups!! Well, I certainly like the peapod necklace and I sure do like the other pieces but I love that Carmen Miranda Necklace! It's so much fun! Lori, you always impress me with your creativity. Love your work! Your artisan pieces always inspire me and this time is no exception. Gorgeous, outstanding and inspiring! Each soup was so different and what you created was unique and special. Thanks for sharing your mishap too; it makes us feel normal:). Although we never would have known because the piece turned out fabulous. My favorite piece is the first...the pea pod. Love the colors! Not my usual color palette but I think I will try it. I love the whole piece. It just flows. The addition of that ceramic charm in the back is perfection. (I love that artist but haven't ordered yet because I never can decide which are my favorites). Thank you for hosting the party again this year. I am honored to be participating for the first time with such talented ladies. I appreciate all your hard work! If you ever want a day out across the bridge, I will treat you to lunch, homemade ice cream and a leisurely day browsing some little shops in Lewes, DE. I love the Pea pod necklace. Very creative also how you were able to troubleshoot and come up with the idea to use the cording to still be able to use the focal piece that broke...I really like the look!!! Thank you for allowing me to be a part of this BSBP. This is my first time and it has been so much fun. oh I love these all! Each piece stands alone and is so unique. What a great job!! I can't believe I'm just now getting a chance to comment... Everything that you made for this Bead Soup is absolutely STUNNING. I can't seem to pick a favorite... You are incredibly, incredibly talented. Thank you so much for putting together this blog hop... I'm honored to be included in it with such awesome artists as yourself! Ahhh, your pieces, as always, totally rock! I can SO see myself impersonating Carmen Miranda in that necklace...love it! Thanks for your comments on mine...how fun to hear that 'stache jewelry is all the rage now LOL!! Love your use of colours. Your pieces are beautiful. I am in awe of your talent. 2nd piece looks so fun. I really love how you put the beads together. LOVE, love, love. Lori, as always, you've created an amazing feast of your soups. So sorry about your injury, though it didn't seem to slow you down. What a break... pardon the pun, on your ploymer focal - that ended up giving the results you needed. These pieces will all provide a wonderful selection for summer wear. I must admit I am drawn to the Carmen piece. Great work and another awesome BSBP! Now rest and enjoy blog hopping..
My favourite is that colorful necklace, but all pieces you made are beautiful! Beautiful pieces Lori. So colourful! Like them all a lot! Couldn't hop until now but it was worth the wait. Once again your things are outstanding. I would have never thought of combining that green focal with those beads but I love it. Lori you are the best. Wonderful designs, as always. Thank you so much for organising this international blog hop. I’ve had a great time. 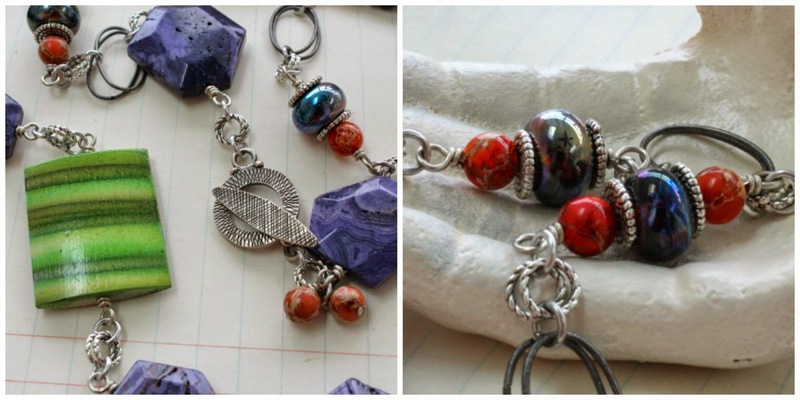 Lori, I love the first necklace,I love the bracelet too, what you do with wire and combining elements is your signature! I admire that in your designs, they look effortlessly put together. I like the colors, that you added orange, and the other colors, with just a touch here and there turned out beautifully. Thank you for the tip on wrapping beads while laying down, that's awesome, I will use that idea, with fibromyalgia! I will come back for soup 2. XO Laura Oh PS, that texture disk is awesome, just figured out how to do that, Im thinking, why didn't I know this before? I will watch my fingers! Oh, those poor fingers! I have the same problems with green and orange - lovely colours but I just can't make it "work" for me. However, I love everything you've made. 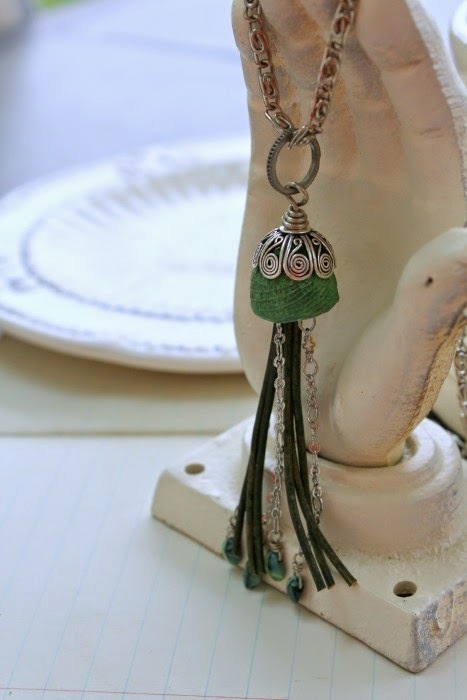 The green tassle necklace is the perfect mix of simple style and interest. Lori I swear I will cease to feel so um unworthy of your hop one day. You do such amazing work and you put so much more pressure on yourself than needed!! Wear that abstract bit of a necklace and something sunny and have a drink on the deck!! Boy did Alenka send you some happy beads! Love the Carmen Miranda necklace, it's funny how something can be a blessing in disguise. I like how you saw a pea pod in your green soup from Claire, but my favorite from that soup was the tassel. Usually it's chain or leather (or maybe that's just me lol) yours had both and I love the look. I hope I can remember it if I do another tassel at some point. I am so glad to read you're finally starting to feel better. Remember, One day at a time and always try to find at least one good thing for the day. :) LOVE those shoes btw!! It has taken me three months to get through the entire hop. Your blog is the final one on my list and I do thank you for a wonderful party filled with a great variety of guests. Bead Soup has been a blast yet again!